Yesterday’s post has got us off to a fantastic start with telling MPs about the #LBBill, so thanks to all of you for your help with that. Today we’ve a post from Sara reflecting on LB and the #LBBill. A while back I was asked by a journalist (could have been on BBC Radio but I can’t remember now) if the #LBBill would have made a difference to what happened to LB. I am really not a natural or keen radio or TV interviewee, particularly when it’s to talk about something so horrific, and this question struck me as simply too sad. I fluffed it. Now it’s time for action with the Bill, it probably is helpful to think through how the proposed changes to the law could have made a difference. [Howl.] First of all, LB should never have been admitted to the unit. If a range of meaningful ‘in-home and community support services’ were available [Clause 1] I don’t think LB would have become so anxious and depressed in the first place. He loved learning to be a mechanic at TRAX. He worked there the day before he died. If there were more opportunities like that and support available to help people access the stuff they want to do (i.e., the stuff that other people just get to do), I’m not sure LB would have got so down. Oxfordshire County Council (OCC) funded support included a 5 day holiday akin to a boot camp with learning outcomes attached to every waking moment that LB hated, and a peer buddy scheme which failed to attract young people and so LB was buddied by someone our age. Simply not good enough. Once we reached crisis point, Clause 3 would also have prevented LB’s admittance. There was no crisis care. Just a number to call and be told to go to the out of hours GP. The modus operandi, certainly in Oxon but I suspect pretty much everywhere else, is to rely on families to do the graft and when things have escalated way beyond what most people could endure or ever dream of enduring, it’s off to the ATU. Instead of chucking more direct payments (as meaningless as trying to spend drachma in the local pub) and talk of ‘respite at a building with a snooker table’ at families in crisis, the local authority should make sure a suitably trained, experienced, enthusiastic and caring team are on call and available to work with people and their families to try to avoid the need for admittance. Slightly ironically (and I still don’t really understand this), the commissioners were apparently happy to indefinitely pay £3500 a week for substandard care at STATT. LB had no desire to live anywhere other than home at that point so Clause 2 was less relevant to us. Clause 4, which is about securing the most appropriate living arrangement, would also have offered LB some protection against what happened. A review of the new ‘living arrangement’ (which we thought was a short term fix) 3 months from the day it commenced would have happened around June 19th. As it was, nothing was done about getting LB out of the unit other than a meeting eventually organised for July 8th (with the pushing of LB’s head teacher despite OCCs grandiose claims to the contrary). Clause 5 was also less relevant to LB again because he was still at school and should have been living at home. Like most kids do. This clause is very important to those people who are living independently however. Most people have a choice about where they live. It’s astounding really that we’re trying to change the law to protect people from being moved against their wishes. One of the things #JusticeforLB has achieved is shining a spotlight on the murkiest of practices that continue in health and social care. I was chatting to someone the other day who said they read our posts with a mix of incredulity and horror. That light shining is embedded within the LBBill, particularly in Clause 6 which places a duty on local authorities and the NHS to report annually on all their living arrangement activities (with full disclosure on the when, why and hows involved), and the Secretary of State to summarise these in an annual report. This is bloody brilliant really and I hope, if the Bill becomes law, there is clear and careful scrutiny of this data at both a local and national level. Using lenses with aspiration, imagination and happiness etched in gold around the frames. Clause 7 involves sensible rewording of the Mental Capacity Act and Clause 8, again sensibly, removes learning disability/autism from the Mental Health Act. Er, because neither are mental health issues. Clause 9 makes sure that despite Clause 8, people can still access mental health services. [I know]. I also love Clause 10 [I love it all really but some bits are stand out stars for me] which is about being open and transparent with the person whose ‘care’ or support this is about. A chewy bit of ‘nothing about us without us’ which is so blinking obvious. Invite people to meetings about them, give them free support to attend, let them respond in whatever form they choose and communicate the decision from the meetings in an accessible form. Bam. As simple as. And shameful it doesn’t already happen often. LB was only invited to the last 10 minutes of the Care Plan Approach meeting during his 107 days in the unit. He wasn’t told about the weekly meetings or informed of what was said. Despite all the nonsense about making us get his permission to visit him daily, not one member of staff communicated anything meaningful to him about why he was in there. But that was because they didn’t know why he was there and no one bothered to put the support in place to enable him to come home. A situation that would not be possible (or certainly should not be possible) if the law is changed in the way we are proposing. The Bill finishes with a bit of welly wielding stating how the Bill will be enacted [Clause 11] because there ain’t no point in changing the law if the law ain’t followed. So that’s it. A more coherent answer to the journalist. It’s been a while coming, but we hope Draft 2 of the #LBBill is worth the wait. As previously blogged, we have had tonnes of feedback on Draft One of the Bill, by email, on social media and in a number of brilliant face to face meetings and events. We were pleased to see that although lots of people wanted the Bill to go further and do more, there was little if any disagreement at the idea of a new law to protect the rights of disabled people to live in their communities where they choose. A key theme of the second draft is a stronger focus on enforceable rights rather than general duties. This is most obvious in Clause 1, which now would give disabled people a right to choose where they live unless the Mental Capacity Act or Mental Health Act is used to force a different outcome. We have also made the right on the state to take account of cost and its resources in Clause 4 subject to this duty. This all gives a much stronger focus on the rights contained in Article 19 of the UN Convention on the Rights of Persons with Disabilities. Another major change is in Clause 8 in relation to the Mental Health Act. There was extensive debate on this, and in the end we felt that the best option was to retain the Mental Health Act as an alternative to disabled people being sent to prison for criminal offences. Clause 8 would still though stop disabled people being ‘sectioned’ under the civil provisions just because they have autism or a learning disability. We welcome more debate and discussion on this key issue. While we have the MP’s attention with the Bill, we want to take the opportunity to ban the use of ‘secret’ panels to make any decisions about disabled people’s care – this is new Clause 10. There are a number of other changes, please check out the drafts for more. I particularly like the new clause 3(3), which would require the employment of disabled people in teams responsible for commissioning and planning services. One of the strongest messages I took from the debate on Draft 1 is how little trust there is now for the state to ‘look after’ disabled people. When disabled people and families were speaking about ‘safeguarding’, they meant protection from the state, not by the state. At its heart this lack of trust comes from an unequal power relationship and the constant threat of state-sanctioned violence, as Chris Hatton has written about recently. 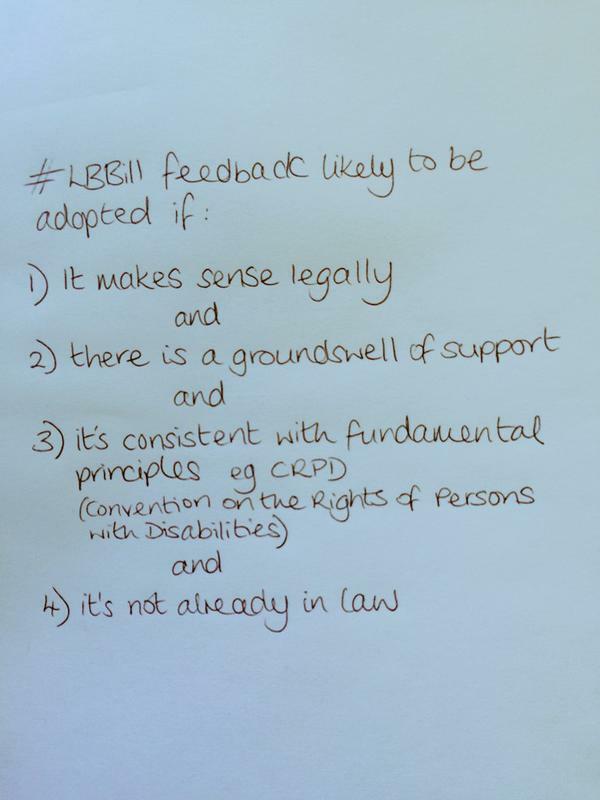 We hope #LBBill can play a part in redressing that balance and promoting proper respect for disabled people’s human rights, like the best public bodies show now. Having considered the new Care Act I’m convinced we need to go further in the ways that Draft 2 of #LBBill suggests to get the kind of legal scheme we need. Feedback on Draft 2 is very welcome. There can be a Draft 3 if the feedback shows it’s needed. In the meantime as soon as the dust settles on the election we will be asking everyone to lobby their new MP to support the Bill. Even though the No Rights Ignored green paper contains some of the ideas in the Bill it goes nowhere near far enough, so we will still be looking for a backbench MP to adopt the Bill at the Private Members Bill ballot in July. In our last post we re-launched #107days and shared the video that captured some of the wonderful action last year. In this post we wanted to provide some further context for the campaign. 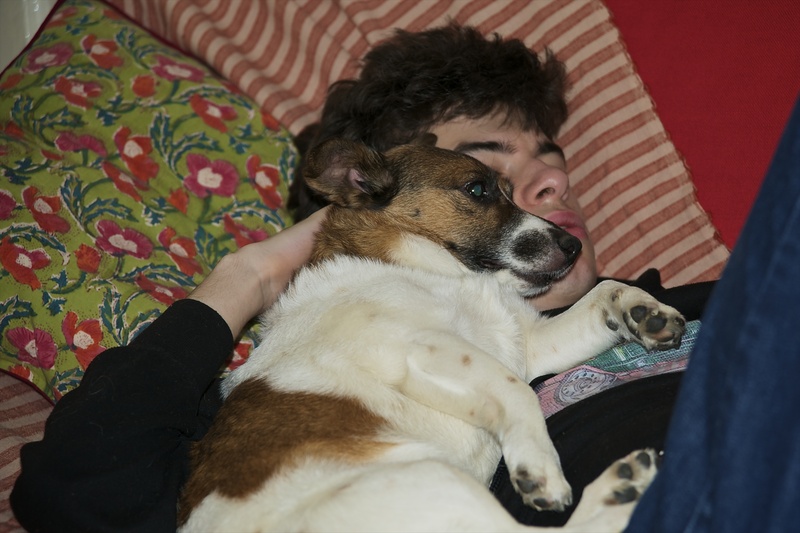 The simplest way of doing that is by sharing one key document, the #JusticeforLB Audit Report, and a Newsnight feature, both produced in response to the National Audit Office report into learning disability published at the start of last month. Our Audit Report is called Actually improving care services for people with learning disabilities and challenging behaviour. You can download it by clicking on the cover below, or the link here. 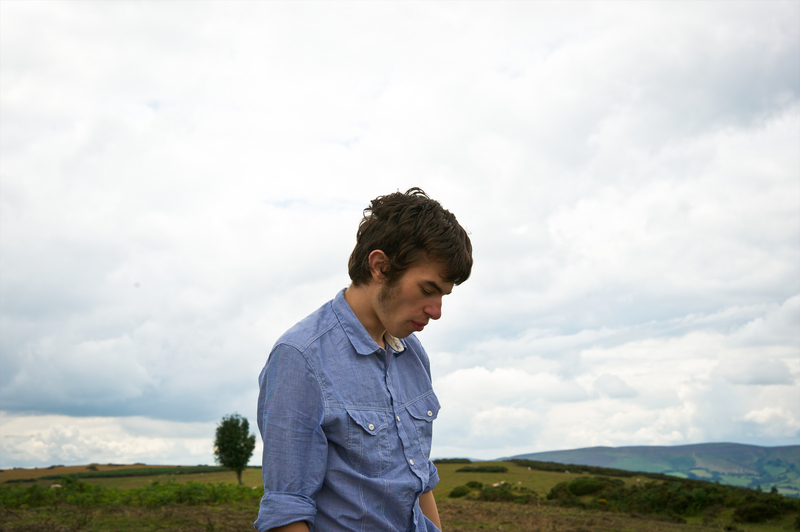 The report examined the challenges faced in delivering key commitments of the #JusticeforLB campaign manifesto, the extent to which these have been achieved, and the barriers to achieving JusticeforLB and actually improving care services for people with learning disabilities. Our headline message was that we believed that the JusticeforLB campaign demonstrates that a considerable amount can be achieved if you strip away layers of tired bureaucracy, hierarchy and vested interests and just get on with it. In a genuinely collective way. So many of you spontaneously, creatively and magnificently got involved with #107days last year, and we’re extremely grateful for your support. One of the things that we tried to capture in the audit, but would like to understand further, is the impact that the campaign has had. To that end, please share with us what difference the campaign has made for you. 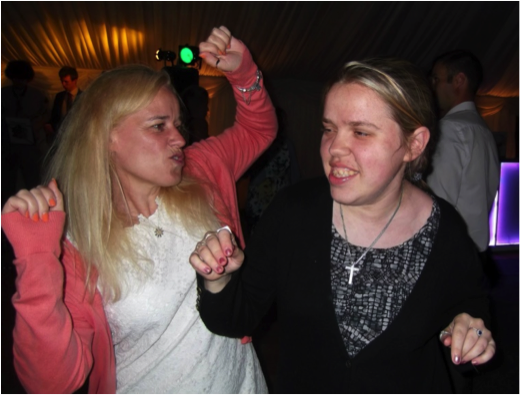 We got to know Sara, LB’s mum, initially through her research and writing, chats at conferences, inviting Sara to speak at conferences we have organised and in various parts of the world at Disability Studies conferences. We are sure people know this but Sara is a really respected researcher in the field. She does in practice what she writes about in articles: inclusive and participatory research. Especially, her work is know by us for foregrounding the important role played by researchers who are also mothers of disabled children. For example, her paper ‘Busy Behaviour’ in the ‘Land of the Golden M’: Going Out with Learning Disabled Children in Public Places, was a real gift shift for us: especially the line where she talks about the community ‘not doing odd’. We loved that phrase and have used the paper in lots of our teaching and writing. (Here is a link to the paper). We also read Sara’s blog and were struck by the humour and affirmation of LB and his family. It was a joy to read. And then LB died. We continue to read her blog and recently Dan had the pleasure to catch up with Sara in person. This was bitter-sweet, of course. We were there for the Manchester partnership conference and the reason we were there, of course, was because of honouring the #JusticeforLB campaign. We wished we were meeting for different reasons. LB did not deserve to die. The reason he died says so much about the disabling society that we live in and the violent institutions that continue to fail LB and all the other dudes. We wondered, together, if our research really matters anymore. Can academia contribute anything to contest these conditions of disablism? On reflection, we think that research/ers and the academy can do much to challenge disablism but this can only happy if we work collaboratively and in alliance with organisations of disabled people and families of disabled children. It is also about using broader methods of communication, not simply academic papers. Sara’s blog has been a shining example of this, reaching audiences and getting people to understand difference productively. We will be there with our daughters Ruby Haf Lawthom Goodley and Rosa Cariad Lawthom Goodley (pictured with the flag above). They have been really affected by LB’s news and have organised to make loom bands to sell at Glastonbury to further raise money for the campaign. 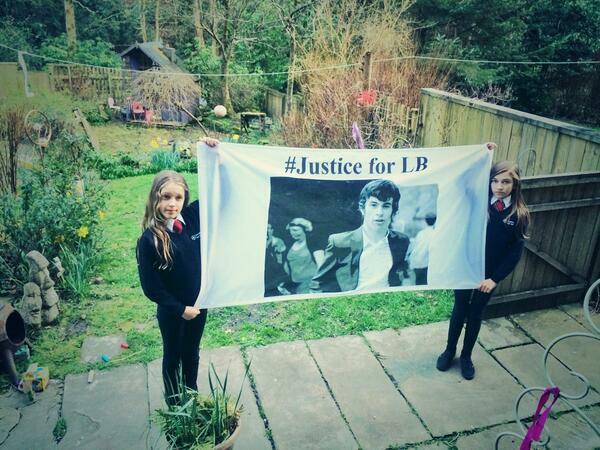 We have also bought a 15 feet long flagpole and hope to get JusticeforLB captured by the BBC coverage. In addition, we hope that other festival revelers will ask us about the flag and we look forward to telling them that LB was a cool dude and what happened to him should NEVER happen again. So look out for it folks: just don’t expect to see it during the Metallica set. We will, though, make sure we get a picture by the cider bus: we think LB would like that. If you are at Glastonbury and see the #JusticeforLB flag, or flyers, or Dan, Rebecca, Ruby or Rosa, please send us a pic. We’d love to share in your Glasto experience. Day 86 of #107days was adopted by Jenny Morris. Jenny blogged early on in the campaign and has also been interviewed by journalists for a number of pieces that relate to LB. Jenny’s expertise and knowledge is very valuable and today she offers a blog post with her thoughts and knowledge on communication. I’m writing this because LB’s death and the campaign itself demonstrate two really important things: firstly that – at a time when so many aspects of social policy and social attitudes are going rapidly backwards – we need to hang onto what we have learnt in the past about the importance of everyone’s human rights and how to promote them; and secondly that if we really want to bring about positive change we have to do something fundamentally disruptive to existing systems. If the ‘abject failure’ of the Winterbourne View transfer programme teaches us anything, it is that you can’t change outcomes unless you radically change the systems that are responsible for the problems in the first place. I’ll come back to this point. The campaign is also making a quilt, made up of patches sent in by many different people. The photo above is the patch I’ve sent and it sums up one important issue I want to highlight. 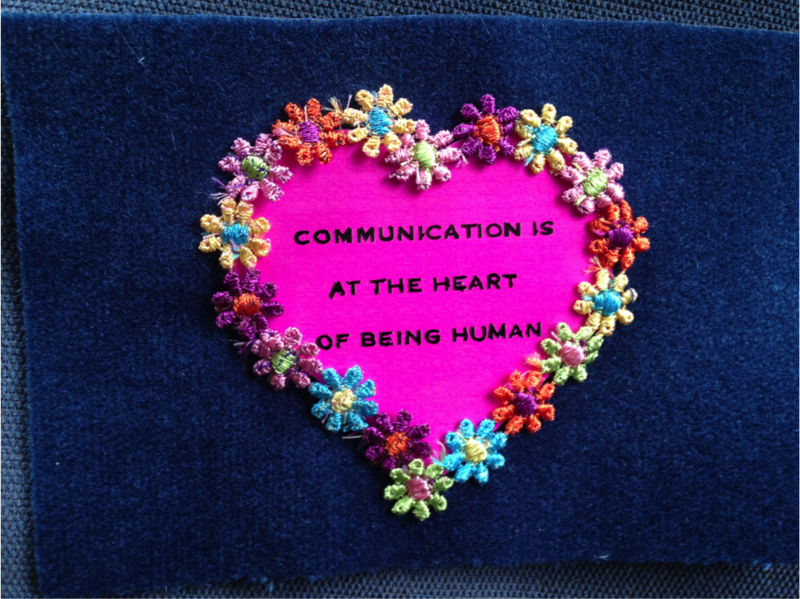 ‘Communication is at the heart of being human’. Sadly, some people will react to this statement by saying ‘But some people can’t communicate and you’re therefore saying they aren’t human’. Such an attitude goes along with a failure to recognise how people can and do communicate. Communication isn’t restricted to being able to speak, or write, or use sign language. Most importantly, communication isn’t incompatible with significant cognitive impairment or what people call ‘severe learning disabilities’. Communication is about recognition of a message being conveyed – it is a two way relationship and we should be paying far more attention to the ‘recognition’part of the relationship. Instead of saying ‘he can’t communicate’, we should be saying ‘I don’t understand how he communicates; I need to do more to understand, acquire more skills and knowledge, talk to people who know him better than I do’. How many times have you heard someone say (as I heard only a few days ago): ‘X has severe learning disabilities and can’t communicate at all. She loves swimming and lots of different kinds of music’? My heart sinks when I hear something like this and even more when the speaker then goes on to describe X’s ‘challenging behaviour’. The statement is both a denial of the human right to communication and – ironically – at the same time it is an unintended recognition that X has in fact communicated very effectively about what makes her happy. Attitudes like this go along with a failure to focus on ourselves as a recipient of communication, and instead place all the responsibility on the other person. Such attitudes betray a failure to use and develop our own skills of observation and understanding; and a failure to use the skills and experience of those who know the person best and who understand how and what they communicate. You have to wait a long time for him to react. Although if he’s feeling negative about something he soon lets you know – he screams and shouts when he doesn’t like something but it can feel very unfocused because it feels so extreme. It feels as if it’s just coming from inside him but actually when you think about it, it’s usually something outside himself that he’s reacting to…because his negative reactions are so obvious it’s quite difficult to see his positive reactions but they’re there if you really pay attention. Imagine if everyone ignored you when you spoke or consistently misunderstood what you said. Imagine if people do things to you, for you, without paying any attention to what you say, to what you want, need or feel. Wouldn’t you ‘scream and shout’? One of the things I try and do with most of the posts I write is to remind ourselves of what we’ve already learnt, and sometimes achieved, in the past. Many people who have contributed to the debate following both LB’s death and the ongoing failure of the Winterbourne Review Joint Improvement Programme have referred to the important work of those such as Jim Mansell and to, for example, the origins of Person Centred Planning. As Sara Ryan, LB’s mother, has written: ‘We sort of know so much in many ways and yet so little has changed for learning disabled people in the UK’. Contrary to what usually happens, people with challenging behaviour need more rather than fewer choices, and more opportunities to control their lives in terms of what they do, where they spend time and who they are with. Apollo was the god of order and rules, and these organisations try to divide up the work into neat and distinct areas, where everyone has a clear defined role. Each role has a job description and a defined area of authority, with clear lines of accountability and hierarchical systems of decision-making. These organisations cope well with stability but struggle to deal with major change. There is a danger that change will simply be incorporated into the existing structure and have little impact, if cultural and values issues are not explicitly addressed. This publication was promoting person centred planning and challenging the way support is delivered, but the analysis can be applied in a wider context. We have systems which result in people entering and remaining in institutional settings because housing isn’t available. We have systems which create additional support needs because health needs are unrecognised and/or untreated. We have systems which take mechanisms, such as direct payments and personal budgets, intended to increase an individual’s choice and control but which instead apply an Apollo culture of order and rules which undermines self-determination – there are many examples of this but Mark Neary’s experiences are just one. A clear lesson from the past is that in order to bring about real change the entire system has to be disrupted so that the focus is on creating more opportunities for people with learning disabilities to communicate their preferences and experiences. We need something like Chris Hatton’s proposal that control of all the money currently spent on keeping people in ATUs (an average cost of £4,500 per week!) should be given to a ‘ninja task force’ which puts people with learning disabilities and families in charge and works to ‘develop local, individual supports for people moving out of these services’. A key issue will be the availability of housing – though there are lots of good practice examples of how to provide real homes for people with learning difficulties instead of tying money up in institutional provision. One thing that most of the reports which follow ‘scandals’ in health and social care systems illustrate is that services which deny the fundamental human right of communication create at best ‘challenging behaviour’ and at worst abuse and neglect that can end in death. And this applies as much to, for example, older people as it does to people with learning difficulties. In order to bring about real change we have to reconstruct systems and services that have as their main motivating force the ability to recognise and act on what an individual communicates about their needs. It is only by changing who has control over the available resources that we will have any hope of both protecting and promoting the human right of communication and of avoiding the wasteful expenditure on services which all too often fail those whose lives they are supposed to enhance. Morris, J. 1998. Still Missing? Vol 1: The experience of disabled children and young people living away from their families. The Who Cares? Trust. Wertheimer, A. ed. 1996. Changing Days: Developing new day opportunities with people who have learning difficulties. The King’s Fund. Sanderson, H. et al. 1997. People, Plans and Possibilities: Exploring person centred planning. Joseph Rowntree Foundation. I think Sara is brill, and met her several years ago, along with Katherine Runswick-Cole (Mum’s and sociologists together), oh and we’re going to write a book, but it never happened, YET. I saw Sara at a conference in Coventry, not long before LB’s death. Things were not okay, and Sara looked pretty drained… I went away with a heavy heart. My daughter is 27 years old, learning disabled, fun, and one of her big loves is cutting out piccies from the Argos book – they tend to be bottom drawer items, and then she makes lists. She also loves performing! I cannot feel what Sara is, but do worry for a future for my dude-ess and all others out there. I adopted today to take Sara out to do something nice – nothing about the campaign, nothing about work (we are colleagues) – but just a bit of a treat. Any of you who read Sara’s blog will know what a toll this has taken on her, and how in the midst of coping with personal grief she has been thrust into a role as a highly effective but reluctant campaigner. She deserves a break. Sara and I used to chat a lot about parenthood and our kids as they moved towards adulthood. Sara’s daughter and my older son did their A levels at the same time, so we compared notes over exams, university choices, student loans – and about how on earth we’d feel when they left home. How could our babies possibly be old enough all of a sudden to make all their own choices and be responsible for running their lives? What changed so dramatically overnight on their 18th birthday to make us redundant? I remember talking about the way the term ‘helicopter parent’ is used to ridicule parents who can’t let go, and agreeing that maybe it was all a bit more complicated than that. Of course we cried when our firstborns left – and of course over time we discovered it wasn’t quite such a separation as we feared. They ring up for advice, they come home for holidays and leave their laundry lying around, they ask for money; we ask them about their new lives (and sometimes they tell us), we remind them about stuff, we still ask them to do the washing up. It’s not a sharp divide between dependence and independence at 18, but a gradual handing over of freedom and responsibility over many years, all the while providing the safe backstop of parental love, interest and concern. And then we got to talking about the next two kids approaching the cliff-edge of 18 – LB and my younger son. The same age, but with such different prospects. While my son followed his big brother to university, Sara has blogged about the lack of an ‘imagined future’ for LB. Long before he was admitted to The Unit, she was anxious about the absence of meaningful opportunities for him when he left school, but determined she would find something. Then came The Unit, and the stripping away of all aspiration, meaningful activity, and responsibility to do something productive. Replaced with vacuous ‘choices’ to do nothing and a cruel version of ‘autonomy’ in which Sara – who had loved and looked after him with inadequate support for 18 years – was cut out of decision-making. Worse, she was labelled as a pathological ‘helicopter parent’, part of the problem preventing LB from being an independent adult. Of course we have to preserve individual rights for people with disabilities, of course we do. And the relationship between young people and their parents is often complex and sometimes damaging. But here’s the irony. While my sons and LB’s big sister were feeling their way gradually towards adulthood with family support along safe, well-trodden roads, LB – the one with less mental capacity and adult competence – was bundled sharply into it with no map and no guide. It feels, to paraphrase Thatcher, as if care services believe ‘there’s no such thing as family’. To exclude all parents as a matter of routine is surely wasteful of all the care and understanding they can bring, as well as tough for us parents. So today is a day to think about Sara and all the rest of the family, and reflect on their needs and what this has done to them. We can’t make it right again, but we can try to create little pockets of peace and relaxation to lessen the pain for a short while.